Seeing, hearing and making sounds are not the sole domain of those of us surrounded by air; ocean invertebrates and vertebrates see, sound off and hear, too. In part one of this two-part story, you will get an eyeful of information along these lines, and next week I’ll give you an earful (both animal and human induced). Lower animal eye designs are extremely creative and diverse. The simplest lower-animal eyes act solely to determine light intensity for sensing danger or aid in food foraging. Some simple eyes lack even a pinhole optical element to form a single image. Consider the scallop. The multiple, tiny blue dots poking out of its shell’s open slit are really eyes, but don’t compare them to an eagle eye because this shelled mollusk only senses light and dark from the lot of them. 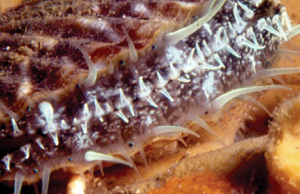 Scallop eyes harbor reflective mirror optics, which gather light for the sensors of each small retina to allow for sensitivity to movement or light changes. When a scallop senses rapid movements nearby, it snaps its shell shut over its eyes for protection, kind of like an involuntary reaction we might have to a horror flick. The octopus revels in a fairly advanced camera-type eye with an active rectangular iris, which can contract to a narrow slit. Though it can focus its lenses for near and far vision, images are not well-defined like with the human eye. However, this intelligent animal uses its adjustable-focus system like a control tower of sorts to keep an eye on each of its eight arms, as well as to look for food and watch for predators. Because fish eyes function much like ours, it’s not surprising researchers initially diagnosed all the finny ones as a nearsighted bunch because, unlike us, fish don’t focus by changing the shape of the lens. Instead, they move their lenses in and out to focus. Fish judge distance using all their eye parts, easily distinguishing far objects and close ones. The exact innate eye position governs the overall range of sight: Hunted fish tend to be wide-eyed; predators appear cross-eyed. Predatory fish generally have superior vision to prey fish. And although many fish don’t have direct control over eyeball movement, some fish like the turbot do have eyes that move independently: one eye on the predator, the other on an escape route. 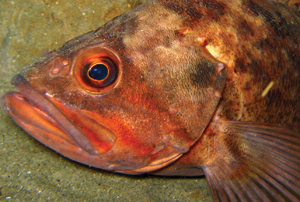 Most fish have an eye positioned on each side of the head to provide both vertical and horizontal vision. They generally look sideways to better see objects at a distance and look straight ahead to best see what’s close up. If their eyes bulge out, so much the better, as it extends their viewing range. This all-around visual aptitude is a must for fish because they have no neck. Imagine trying to watch your back for predators all day without a neck. You’d have to turn your entire body around, not just your head. Fish also react to light differently than we do. Our irises open and close to control how much light comes into the lens such that our pupils grow bigger in low light and shrink in bright light. But most fish have a set pupil size and, consequently, elicit stone-cold stares, which I try not to take personally. These fish control light by alternating cone (color) and rod (black and white) cells in their eyes. During daytime, they use mostly cone cells but shift to rods at nighttime. We do the same, but unlike the mere minutes we need to, for example, adjust to a darkened theater, the changeover in fish takes several hours and explains why fish are long-stunned by the harsh beam of a diver’s light. 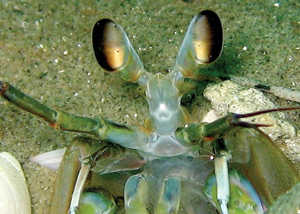 A mantis shrimp’s eyes are considered to be the most complex in the animal kingdom. The two outsized eyes jut out where they can rotate a flexible 70 degrees. Each eye is divided into three regions so objects can collectively be viewed with three different parts of the same eye. In other words, each eye has trinocular vision and depth perception (we have only binocular vision and require both eyes for depth perception). With a whopping eight different classes of visual pigments, a mantis shrimp enjoys vision that not only extends far past ours in the color spectrum but includes ultraviolet and infrared abilities as well. And don’t bother trying to sell a mantis shrimp Ray Bans because the invertebrate also detects different planes of polarized light. So what can we glean from all this eye contact? There’s more than one way to see a cat, figuratively and literally. I do feel a bit cheated with my human eyes now, knowing the psychedelic trip a mantis shrimp must enjoy daily. What might it be like to nix expensive sunglasses, enjoy spectacular night vision without special binoculars and see more of the colors that make up a rainbow? An eye-opener for sure.